Yet another eventful year has passed in our collecting hobby so what is there to report? 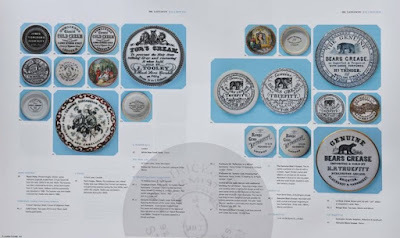 The long awaited Ointment Pots update has now been published within the incredible book produced by Messrs Houghton, Layden & Taylor entitled Historical Guide to Advertising Pot Lids. Quite a new number of delftware type pots, 29 in total, and many Victorian era produced pots have now been recorded in the relevant section having surfaced since the previous Ointment Pots books was produced back in 2005. There are 35 pages dedicated to new finds and for sure some of these new discoveries are simply breathtaking. The authors together with the valuable assistance afforded by Roger Pellow, have gone to great lengths to research the information and photograph these new pots and they all must be complimented for their efforts in bringing this information to light for us fellow collectors to appreciate. Try finding the delftware pots to purchase! Like finding 'hens teeth' they say. I had a stroke of luck the tail end of last year when a lady from Holland contacted me having become aware of my 'wants list'. She had just acquired a pot from a Belgian dealer with the name Eberlay's Ointment. According the to 'bible', only one of these pots albeit damaged and restored, had been recorded. I was offered the pot for my collection and upon receipt, it transpires that the original pot thought to be faithfully restored following the owners mishap, did in fact carry an error in that the apostrophe was missing in the title name. Eberlay's is the correct name. Picture herewith. 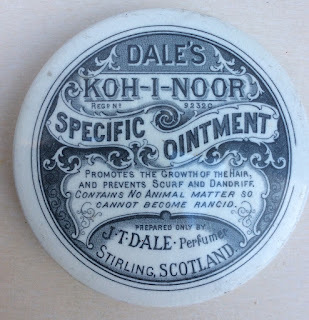 The elusive '6d' Mrs Croft Ointment pot surfaced on eBay during the year which was spotted and won by an elated well known Chesterfield collector for around £450. You can imagine his joy with adding that pot to his local collection. A couple of Ointment lids came my way including a nice Holloway's Maiden Lane New York non pictorial lid which would be the US one dollar size and an Edgar's Kingaline Ointment. This was dug in Nova Scotia in Canada according to the seller. Some rare pots that changed hands included a Wormalds Manchester pot for £600, an Electric Herbal £600, a large Egyptians Salve with dark band £255, O.P. Browns 32 pages pot at £127 . A rare St. Georges Ointment lid was sold on eBay in February for £255 and a Holloways non-pictorial lid for £265. Not sure where 2017 went but it certainly whizzed by. So what happened in in 2017 on the sales front? An ISOLA pot which had been repaired changed hands in February for £233 and a nice Scotchburns pot found a new home in July for £337. A Downies Newcastle pot sold for £200. A Holloway's lid with the 3/- price sold for £75. 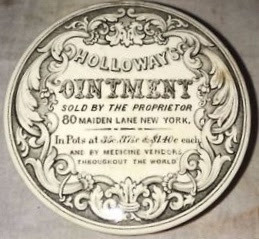 The usual splatterings of Holloway's, Clarke's, Egyptian Salves also appeared on the market. Glamour pots seem to be quite fashionable and prices for these have certainly crept up. The BBR auction sales in July and October proved this point. A rare Holloway's sepia print lid with the USA address of 80 Maiden Lane New York was highly chased in December achieving a price of US$736 (£533). This would have been the US$1.40 size lid and is the first time I had seen one of these lids for sale in the open market. 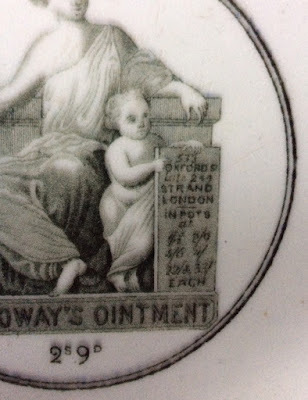 A small ointment pot with the same address, size 35c with a minor rim chip sold for US$97 (£70) in January 2018. In the January AA Auction, an unopened Dr.Rooke's Ointment with its paper labels around the body sold for £100 flying to New Zealand, a Lygnum Salve pot sold for £35 and an Egyptian Salve pot (priced 1/3) with its original celluloid cap sold for £45, this apparently had its contents still inside. Some excitement in February 2018 became evident when a large Holloway's pot lid appeared on the market in the huge size of circa 120 mm. 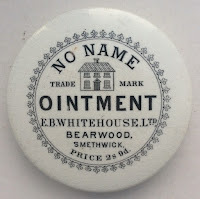 This is the 36/- size ointment lid with the Southwark Street London address and to my knowledge, this size had never come to light before. I always wondered if these larger pot lids with the 12/-, 24/- & 36/- prices existed. Sadly the base was not available to purchase with the lid. Maybe suggests the two other later priced large pots are out there to be discovered. This item originally appeared on eBay as a Buy it Now price of £20. The lucky buyer who realised this item was a wee bit better than the norm snapped it up very quickly and then proceeded to resell it on the same online auction for the sum of £410 a couple of weeks later. No doubt both seller and new buyer must have been quite happy! A nice and rare Samuels Good Samaritan pot was sold end of February for a healthy £460 and an early Holloway's pot was also sold first week of March, the Family Ointment for over £100. 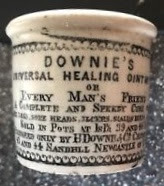 Sadly, a fraud came to light at the end of the year / early January concerning a Downies Universal Healing Ointment pot. A pot was posted for sale on Facebook and a lot of interest was shown in it and high offers made. It transpires that the lid was purchased by someone who then paid the agreed sale sum and then did not receive the pot in the post. The same pot was subsequently listed on eBay and duly sold following 33 bids. Again the buyer did not receive the pot although payment had been made; only an empty parcel was received which appeared to have been tampered with, possibly by the sender to make it look like the pot was stolen in the postal system (unlikely my opinion). This particular Downies pot has some distinctive markings/flaws on the transfer and thus easily identifiable. If you are offered this pot beware that it could well be stolen or be part of a fraudulent attempt to sell a pot that is not owned by the supposed seller. Here is a picture of the pot. Note the imperfection in the transfer application at the top. The Ebay sellers name was dahewitso0 based in Alnwick, and the sale on eBay ended 28/1/18, item no. 253376860443. The person that was trying to sell it on Facebook had the name of Tony Wood. There is plenty of dialogue on Facebook concerning this matter. On a more positive note, during 2017, I managed to add a few Ointment lids and a couple of Glamour Pots to the collection as pictured below. The new pot lid book that has been long awaited is now with the printers and it is now hoped that the release may well be in the summer of 2018. There will be a hard back version priced at £120 and a soft back version priced at £75. a voluminous tome with over 700 pages. The front and back covers are shown herewith together with a couple of sample pages. Within this publication there will be an up-date section covering new Ointment Pots that have surfaced since publication of the Historical Guide to Delftware and Victorian Ointment Pots book. Contact me. please if you would like to order a copy or two of the Advertising Pot Lids book and I will put you in touch with the authors. 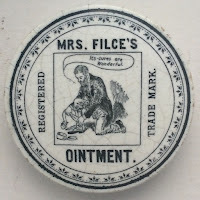 The market appeared to be fairly quiet on the Ointments front since March but an exceptional Ointment pot lid did appear on eBay apparently for the first time early September. 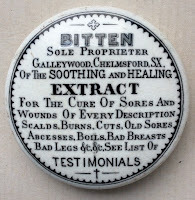 This was for a Dr. Goldings Ointment for Ringworm and Scalled Head. Apparently an unrecorded lid (although the company had been recorded,) and was highly chased by several collectors, selling for £401 plus p&p. A couple of large Clarke's pots appeared and sold, mid size for £45 and large size £50. In September, a nice O. Phelps Brown small size pot sold for £84, and a rare Regesan ointment pot, quite stained was highly chased to £126. these rarely appear on the market. At the Elsecar Summer National show I was delighted to acquire what may well be a unique piece of pottery for Thomas Holloway. 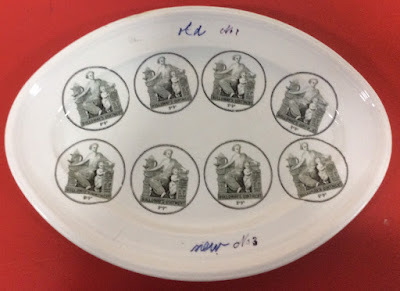 It is a plate showing a change of the pot lid transfers when Holloway moved premises from the Strand address to the Oxford Street location. It has the Victorian kite mark on the back, unfortunately too feignt to read, but I would guess the plate dates to around 1868-70 to tie in with the address change. The transfer shows 533 Oxford Street late 244 Strand. All 8 transfers appear to be the same with 'Old no. 1' written on the top, 'new No 3' on the bottom, and is 16 inches long, 12 inches wide. It has been a while since I last updated this internet site. It has been now refreshed with a slightly new layout, better photographs with a few new pages added to show the Charles Tonge Indian Ointment, the Glovers Ointment and the 'YADIL' pots from Clement & Johnson. During the least couple of years, the collecting of Ointment Pots has continued to be quite buoyant with a few of the scarcer pots coming to market via eBay, BBR Auctions or via the recently established AA Auction online site. It is apparent to me that some new collectors have entered the market so competition to obtain the much harder to find rarer pots continues to be strong. I have been fortunate enough to add a couple of new pots to the collection. 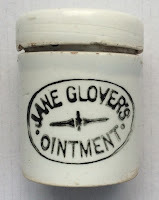 The early High Street address Egyptian Salve pot in the small size, the Clarkes mid size pot with the spelling variant of the word 'Abcesses' (as opposed to Abscesses) and a Jane Glovers Ointment from Australia. 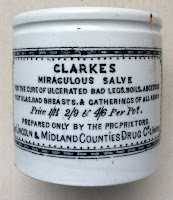 There are three sizes of the pot containing the Clarke's Miraculous Salve each with the two spelling variations to look for. I have attempted to do an analysis of where the Ointment Pots come from within the UK. A new page has been added to this site with some information to show that London naturally has the most producers with the counties Yorkshire & West Midlands also producing quite a few retailers. Ointment pot lids also continue to be popularly chased with some high prices achieved. The rare 5 shillings Holloway's Ointment with the classic pictorial of the seated lady, Southwark Street address sold 2015 for over £230 on eBay. A nice 4/6d example of the same lid sold for £90 early February 2016. 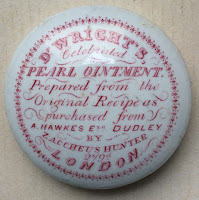 The Baumbraugh's Never Failing Ointment lid appeared for the first time as a batch of these were found after a chemist shop was cleared out in Leighton Buzzard. These were quickly swept up by keen buyers at a regional show where they appeared late last year. Prices achieved were mixed as quality of print varied considerably with a few of the better ones achieving a price as high as £70. A nice Ellen Hales Brandon St, London address lid sold February 2016 for £127, and in January 2016 a Doctor Hardy Celebrated Scorbutic Ointment lid sold for £87. 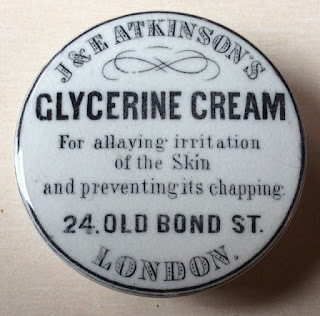 Also January 2016 saw the sale of the Holloway's button lid for Excema Glyco Vazin cream achieving £56. This lid is not part of the Thomas Holloway range but a regional retailer with the same surname from Taunton Somerset. I wonder if the buyer knew this fact? BEWARE and Be AWARE though that fake lids continues to show their ugly face. Some are obvious but others not so. Only this month a reproduction ISOLA lid has been marketed for sale on eBay with the seller pleading ignorance as to its genuineness when questioned. Bidding went as high as £330 before potential buyers retracted their bids after doubts of its authenticity became apparent. See the ISOLA page under the Victorian Pots page on this site for comparative images. I am still searching for an 11 /- size plain pot with the price on the side which would have been the base to the Holloway's 11/- pot lid. Has anyone got one? I have never seen one. I have seen the 22/- and the 33/- pots and pictures of these are on the Holloway's page on this site under the Victorian Pots heading. Please let me know if you have one, have seen one or know of its existence. I have some Ointment pot lids and Ointment pots for sale - for details see my Sales page. If you have some pots to sell, if you require information or generally want to discuss ointment pot related issues, Contact me. Finally, this pot lid appeared on eBay earlier this year, listed twice before finding a buyer. It sold for the princely sum of 56 pence plus delivery costs ! A restoration project maybe? Maybe the buyer had the smaller missing pieces ? Will it reappear repaired / restored ? :-) I wonder ! Well, 2013 came and went and no end in sight of the recession. however trading continued in the bottle scene as collectors tried very hard to enhance their collections. 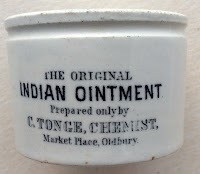 During 2012 there was the excitement of a new pot surfacing, the Indian Ointment, prepared only by C.Tonge, Market Place, Oldbury, dug from a deep tip in the West Midlands. And then late summer last year, a second Indian Ointment pot surfaced for the first time, a different variation, the latter one having the words 'Market Place' omitted. This pot apparently changing hands very quickly on eBay. 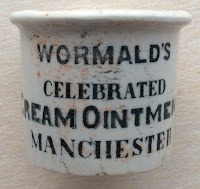 A larger size (1s 1½d) No Name ointment pot from Whitehouse, Deritend also appeared for the first time with the additional words 'Entered at / Stat Hall'. A very nice Scotchburns pot was traded and found a new home across the Atlantic. A large size Holloways pot and lid, the very rare 33/- priced pot, changed hands at BBR auctions back in the summer for a very impressive price! An F.J. Clarke Consulting Chemist, large 4/6 size. Quite a few early delftware pots I am informed also came to light throughout the year and will be featured in the Ointment Pots Update section which forms part of the new Pot Lids book, due for publication late 2014. Throughout the year I was able to add to my Thomas Holloways collection some interesting items including a couple of later items for pills and ointments showing addresses of Clipstone Street London and Whippendell Road, Watford, Herts! These items appear on the Holloway's page on this site. Those that receive the ABC magazine will have seen a couple of articles that I have written regarding ointment pots and Thomas Holloway. I hope you have found these articles to be of interest. 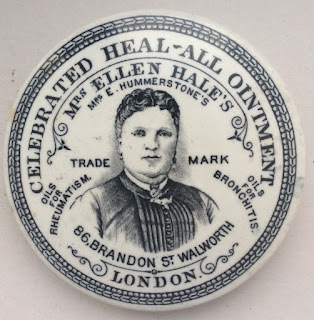 I received contact from a chap in Canada who kindly provided some very interesting information relation to a case concerning Mrs Ellen Hales / Mrs Hummerstone, manufacturer of a so called 'Heal All' ointment that was sold in lidded pots. Pot lid collectors will be quite familiar with the pictorial lid. At Lambeth, on Saturday afternoon, a Mr Walter Schroder. the deputy coroner, held an inquest on Charles Henry Dell, aged 48 years, a porter in a pianoforte factory, residing at Brixton, who died in St. Thomas's Hospital on 24th instant. Annie Dell, the widow, stated that her husband had suffered from an ulcerated leg for 3½ years. Six or seven months ago he went to a Mrs Ellen Hales, who, witness understood, was a qualified medical practitioner, and she gave him some lotion and 'celebrated heal-all ointment'. The wound in his leg healed. He had not been at all well since the closing of the wound in his leg, but he continued at his work until Saturday when he complained of being unable to open his mouth. A doctor was called in, and advised his removal to hospital, where he was at once admitted. M John Alfred Barnes, house surgeon at St. Thomas's Hospital, said that the deceased upon his admission was suffering from lock-jaw. Ellen Hummerstone, an elderly, well dressed woman, said she was the widow of a laborer, and occupied three houses in York Street, Walworth. Her patients called her 'Mrs Hales' which was the name of her mother and grandmother, who practiced before her. The Coroner - Have you a diploma? The Coroner - What do you call yourself? Witness - Well, an ointment maker. I have brought you a pot of my ointment, if you will accept it. The Coroner - Thank you. I prefer leaving myself in the hands of the medical man. Replying to further questions, the witness said that she attended about a thousand patients a week. She never told them she was not qualified, but when they had been with her once, they always came again. The Coroner - I see you profess to cure cuts, wounds, bruises, burns, scalds, ulcers, varicose veins, bronchitis, whooping cough, croup, and a great many other things. Do you treat cases of fever? Witness - No, I draw the line at fevers. Continuing, she said people came hundreds of miles to see her. She did not remember the deceased coming to her at all. The Coroner - Do you make the remedies yourself? The Coroner - How many assistants do you keep? You have an enormous business. Witness - My daughters assist me. The Coroner - Do you inquire into the cause of the wounds? Witness - Yes, and I sometimes send people to a doctor. Coroner - How do you know you are treating them properly? Witness - They would not come again, would they! The Coroner - People do very foolish things sometimes. Well, the doctor in this case says the death of the deceased was not in any way accelerated by the ulcerated leg being closed up, otherwise the matter would have had to be further inquired into. A very interesting article I am sure you will agree! This information was sent to me by a relative of the deceased. Well, 2012 came and went pretty quickly so what happened in 2012? Some new pots surfaced which always is good news, some high prices were achieved in the market and it is great to hear that there will be an update to the ointment pots book scheduled for publication later this year, 2013. 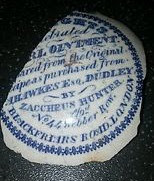 I hear that there will be images and information of at least 40 new delftware style & Victorian ointment pots and information relating to some of the new discoveries. 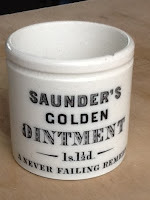 One pot in particular appearing for the first time bears the name Saunders Golden Ointment which was listed and sold on Ebay to a Warwickshire collector for just over £1,000! I had the good fortune to handle this small pot at one of the shows and it is in excellent condition with very simple text. When will the next one surface? 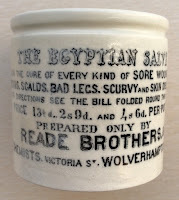 A new Egyptian Salve small size pot with the early address of High St, Wolverhampton came to light. A large size Sturtons pot from Peterborough, probably the 2/9 size, was found in the town and has apparently been restored for the owner, very large size I am told. 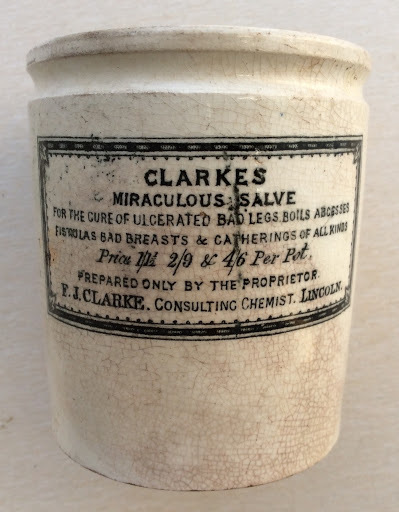 The mid size and large size pots produced by F.J. Clarke, Consulting Chemist have also been seen together with the Large 5/0 pot produced by Clarke's Consulting Chemist bearing the name Clarke's Miraculous Salve (on one line). Lots of trading on Ebay was apparent throughout the year but I noticed that very few pots were available for sale at the shows that I attended, apart from the relatively common small Holloway's pots, the small Clarke's & Poor Man Friend pots of Dr. Roberts. Ointment lids are of course very scarce and highly chased. A very early Holloway's lid with the first trading address of Broad Street, London showed itself. There were some nice lids changing hands via the on line auction site such as the Mrs Filces, a No Name Birmingham lid with the Deritend address and a splattering of the Mrs. Hummerstone / Ellen Hales lids to name just a few. I received a mail from a young lady in Queensland Australia who informed me that she is a distant relative of Francis Jonathan Clarke (the F.J. Clarke ointment pots), three generations back and she has kindly provided me with some useful information regarding the Clarke family. The page for the Clarke's pots has been updated accordingly. The usual splattering of the Holloway's, Poor Mans Friend pots and the common Clarke pots continue to appear on Ebay. 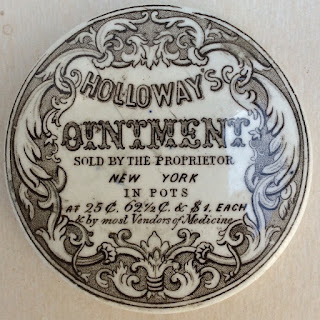 A new addition to my collection in November was another variation of the classic Holloway's Ointment pot bearing the Southwark Street London address but showing the increased price size of 1/3d. I had not seen this pot before and there is no reference to this variation of this price in the bible 'A Historical Guide to Ointment Pots'. The pot can be viewed on the Holloway's page under the Victorian section on this site. Click here to view. Also I have been able to add a 5 shillings Holloway's lid together with the 11 shillings and 22 shillings sizes (no prices actually listed on the pot lid itself). All three are very rare pot lids. The 22 shilling lid came with the original tall pot base which sadly is in many pieces and probably beyond restoration. Again a picture on the Holloway's page. A few additional Edwardian pots have come my way during November too and these can also be viewed, refer to the Edwardian Pots section. 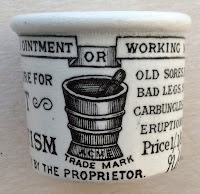 Two Pulticine Edwardian Ointment pots were recently listed and sold via Ebay but both were quite badly stained. Goes to show that they are surfacing though. 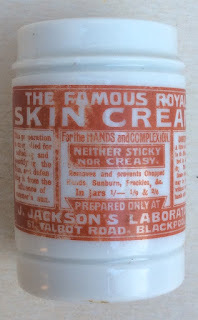 Discovered for sale at the Elsecar Summer National show in July 2011 was a large size F.J. Clarke ointment pot. This pot which had not been seen before was apparently dug from a site in Bury. Until this pot came to light, only the scarce small size 1/1½ pot was known to exist but now the 4/6 size has appeared. This must suggest therefore that the mid size price 2/9 pot recorded on the pots, must exist. 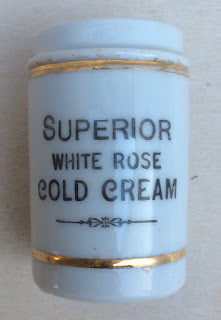 During the Sunday auction, at the BBR organised event, three ointment pots were auctioned; a rare early Dr. Roberts Poor Mans Friend from Bridport which was sold for £350 (good condition but the transfer smudged), a Mrs Wilsons cure for Eczma pot (good condition) was sold for £240 and a L.T. Piver early delftware pot with the London & Paris address (usual rim & base chipping) was sold for £55 All prices achieved are plus add ons. I was fortunate enough to acquire a T.P. Wreaks slab seal pot from one of the outside stalls, a couple of Edwardian glamour pots (Zilka & Benzoin Cream, both red print) and an Edwardian Witch Hazel pot with most of its bakerlite cap in situ. Available on the stalls for purchase was the usual scattering of Holloways, Clarkes and Egyptian salve pots and I did spot a large 4/6 size Beach & Barnicott Poor Mans Friend pot available at £250 which was still on the stall late on the Sunday. I also had a chat with a stall holder who told me that a very large size Sturtons pot had recently come into his possesion, sadly damaged, so it is on its way to restorers. The owner has promised to provide me with some pictures upon its return so watch this space! This is probably the 2s 9d size pot. The 2011annual BBR bottle show takes place at Elsecar the weekend on 2nd & 3rd July. Auctions will be held both on the Saturday & Sunday. It is expected to be a bumper fair so try and make it if you can. I will be trekking over from Normandy looking for those elusive pots that I would like to add to my collection. Looking forward to meeting some new faces and fellow collectors. 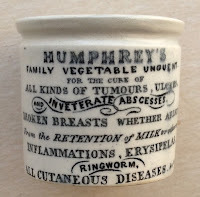 One of the best collections of ointment pots ever amassed was by a chap named Keith Walker back in the 1990's. His collection of ointment pots and other pharmaceutical artifacts, which were located and displayed in his pharmacy museum above his chemists shop in Worthing West Sussex, was collected over a period of 25 years. Due to the need to move premises, Keith decided to sell his collection and enlisted the help of BBR Auctions with the process. A detailed article appears in BBR magazine no. 73 showing some great pictures of his varied collection. 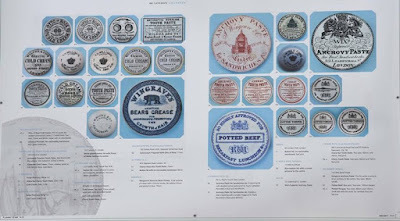 Furthermore, BBR Auctions produced an amazing 62 page catalogue for the sale which took place in June 1997, listing more than 450 lots which included over 60 different ointment pots and over 100 pot lids, most of which were ointment related. All the ointments and pot lids sold are pictured in the sale catalogue so if you get a chance to get hold of a copy, it makes a great reference book.